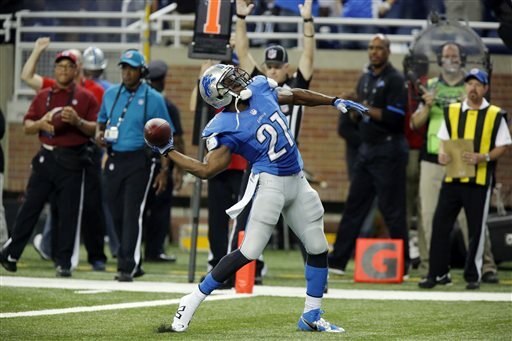 Reggie Bush made his Detroit Lions debut with a splash. The veteran running back was instrumental in the Lions’ 34-24 win over the Minnesota Vikings in the season opener on Sunday at Ford Field. The highlight was his 77-yard touchdown on a short pass from Matthew Stafford. You could almost see Bush shift into gear and turn on the jets to get past the last lines of defense. 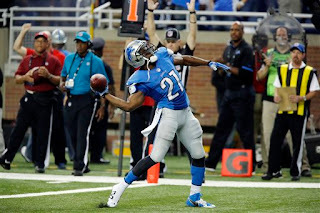 In the spring, the Lions lured Bush to Detroit by showing him the way defenses play Calvin Johnson. To no one’s surprise, that’s what he saw from the Vikings. Bush finished with 191 total yards. He said he wants to average four yards a carry and he was a 4.3 with 21 carries for 90 yards. He also caught four passes for 101 yards. Bush’s work ethic has impressed his teammates since Day One. Running back Joique Bell calls him a workhorse. Now they know he’s tough too because he played through two first-half injuries that could have sidelined a lesser running back. The Lions finished with 117 rushing yards and 352 passing. They aren’t looking for a 50-50 balance with Bush, but they were looking for more from their running game. Bell credited the offensive line with the run game success. “Our O-line was blocking the best since I’ve been here,’’ Bell said, reeling off all their names. “We have a lot of guys stepping up, you can tell the difference in the running game from last year,’’ Bell said. The offensive line is important, but the addition of Bush is key. He gives the offense a new dimension, it’s exactly what the Lions were seeking from Jahvid Best. He gave it to them before his concussion sidelined him. That’s the game Reggie Bush brings. He got a huge ovation from the fans as he ran out of the tunnel prior to the game. It’s been quite a few years since a Lions’ running back has been able to fire up the fans quite like that.